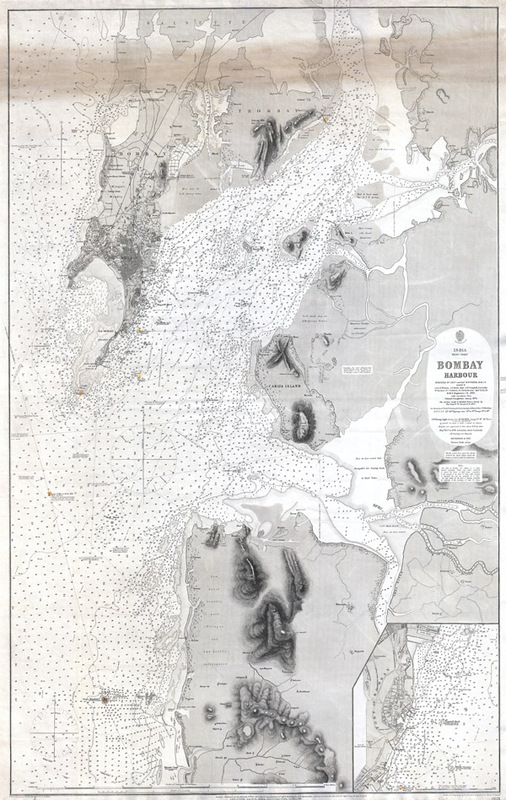 A rare and extraordinary 1879 nautical chart or map of Bombay (Mumbai) Harbor, India prepared by the British Admiralty. Offers extraordinary detail of Bombay harbor from Salsette in the north to Warsole Creek and Veshvee in the south. The city and peninsula of Bombay are beautifully rendered to the level of individual buildings. Notes piers, dock, lighthouses, the observatory, life boat locations, the Lunatic Asylum, the mint, and various workshops and palaces. Miniature palm trees and fields dot the coastline. Also notes topographical features, under sea shoals, swamps, ancient ruins, and forts. The harbor and rivers are dotted with near countless depth soundings in feet. An inset in the lower left hand quadrant details the Fort of Bombay from Old Woman's Island to Carnac Basin. Shows Cornwallis' Statues, the Arsenal, the Coal Depot, the Sepoy Lines, the Marine Battalion Lines, and the Castle. This chart was originally published by the Admiralty in 1864 under the direction of Captain G. H. Richards, Hydrographer. It was updated periodically until 1879 to reflect the work of R. W. Wish, R. Williams, A. L. Brown, A.W. Campbell, Colonel Laughton, and F. W. Jarad. Represents Admiralty Chart no. 2621. Good condition. This map is all in all, in extraordinary condition. However, there is a discoloration along the top of the map, see photo, that we have not been able to remove. Normally as 1200 USD chart, discounted to 700 to reflect area of discoloration.